blocking website free computer parental control software built in adult filter family control filter Keep kids safe online by monitoring internet activity. Set up schedule for each device - at what time which device can access internet. No need fo parental control software windows 7, windows 8 or windows 10. All devices controlled from one place. Your personal weblocker. Powered by a deep packet inspection engine, Application Layer QoS (Quality of Service) lets you see how much bandwidth is consumed by individual applications and devices. If someone is hogging too much bandwidth on non-essential applications — like YouTube or Spotify — you can restrict the amount of bandwidth the device can use for the specific application, without affecting the bandwidth available for other applications. Whereas traditional routers implement URL-based web filtering to block or allow specific content in the network, Synology Router Manager includes a more intelligent web filtering which checks if content is blocked or allowed during the DNS lookup stage of communication, making it harder to sneak through and see unauthorized content, while also reducing system resource consumption. By connecting a USB storage drive or SD (SDXC) card to Synology Router RT1900ac, you can access the contents from anywhere or share files with family and coworkers. 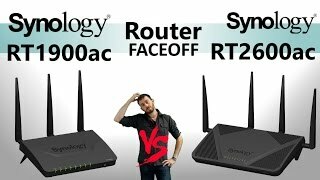 Support for all popular file protocols — like SMB, AFP, FTP, or WebDAV — means Synology Router RT1900ac plays nice with Windows and Mac computers, as well as Android and iOS devices. Synology's free QuickConnect service is the simplest way to access your Synology Router RT1900ac, even when you’re away from home or the office. Just register a unique and customizable QuickConnect ID, and you’ll to be able to log in to Synology Router Manager, access connected storage devices, and do much more from anywhere with an Internet connection. Simply plug in a 3G/4G (LTE) USB modem and create a mobile broadband hotspot for all your devices. This is especially useful for establishing wi-fi connectivity in vehicles, remote locations, or regions with poor wired Internet infrastructure. P.S. For those who need little more powerfull wifi will need to wait for rt2600ac. Keep kids safe online by monitoring internet activity. In real-world testing, RT1900ac could have at least 70 devices connected concurrently, with the tested device ratio of 5GHz (channel 161) : 2.4GHz (channel 1) = 1 : 3. Not all of the connected 70 devices in the testing are in transmission, some of them remained idle. RT1900ac supports at least 40 connected devices that are concurrently transmitting data. The numbers above are for reference only, which could vary dynamically according to users' network scenarios and conditions. Question. I have an RC1900ac. Can I use this as a base for a mesh network with the MR2200ac? The RC1900ac can be used as a base for a mesh network, alongside the MR2200AC. You can add several MR2200AC Routers to your internal networking infrastructure. THE GOOD that RT1900ac delivers excellent Wi-Fi performance. Can work as a capable NAS server when hosting an external hard drive. It is cheaper than competing routers. Range on the 5GHz band is a little short. Good for medium home. Synology latest firmware update for RT1900ac makes BT ISP compatible. It could automatically download and then update. Great. I've had problems in opening ports from my current rotuer provided by the ISP. I cannot get port forwarding to work. Will this help in this regard? The Synology RT1900ac is gear to Synology NAS environment so port forwarding would be an essential option, Plus with its ease of installation makes it a must have in your network. Synology's RT1900ac 11ac Dual Band Wireless first Router Earns CES 2016 Innovation Honoree Award! Congratulations! Ya know... What i want to see in a router now, is an informative and intuitive user-interface (the software thingy you access over http to configure it). None of that TP-LINK uselessness (if you have seen one already). Right now i have a Chinese cctv camera and i cannot tell if it has spyware in it and connecting to a remote server. It is obvious why, my router is a dumb cheapo tp-link.